rock cakes! Since the birth of CJ nearly 3 months ago, I’ve become addicted to an Australian treat…rock cakes! I used to see my hubby eating them all the time but I refused to try them because they looked digusting plus the name of them made me think they were hard like rocks. But because I’ve been so tired with all the crazy feedings and sleeping of a newborn and taking care of a preschooler, I decided to try one when I hadn’t had anything to eat and a lonely rock cake was all that was easily available to eat one-handed. And I fell in love. They’re beautiful! They’re soft and crumbly. 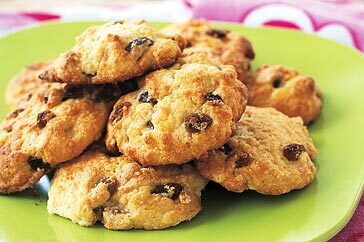 With raisins (or as the locals say sultanas), sugar, and cinnamon, they’re a heavenly treat. As a result, I don’t think I’ll be losing the baby fat anytime soon! PS since I’ve been so busy with the newborn and our preschooler, I haven’t been able to update the blog as often as I would like to and I doubt any change in the near future…at least not until CJ starts sleeping through the night and napping regularly, which to me is only a dream at this point. I’m still around and will post when I have a rare 5 minutes to myself so please keep checking back or email me to see what’s going on! Anyway, I hope all of you are well and hope to get back to sharing my Australian experiences. Keep checking back! Share the post "Addicted to…"
I thought this might be a post on how you found the perfect chocolate chip cookie recipe. Sadly, the Nestle and Ghirardelli ones don’t work here…. Hope it’s all going well. My kids are 21 months apart and I can finally say it does get easier!